Peek-a-Boo Slot Machine | Play for Free, No Download Required! Peek-a-Boo slot machine is a feature-rich casino game developed by Microgaming. 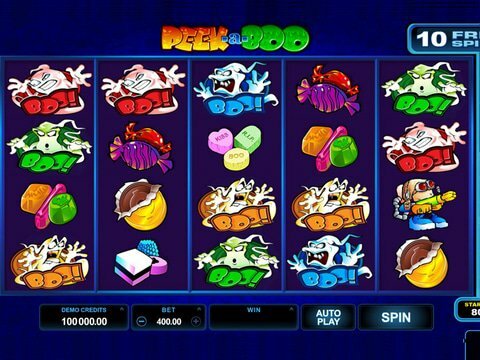 Supported on PC and mobile devices, the 5 reel and 40 fixed payline slot boasts a theme remarkably similar to the Ghostbusters movie but with graphics rendered in a colourful cartoon style. Together with a top win of 2,500x the stake, there's a unique Symbol Win feature and guaranteed free spins that play out on a 1024 Ways-to-Win betting structure! You can check out the bonus features in action in Peek-a-Boo free play slot available as a demo right here. No download is required and there's no registration to submit, simply risk-free gaming at your fingertips. If you prefer real money play, you're invited to Jackpot City casino, a top ranked gambling destination for Canadians that offers a no deposit bonus exclusive to Grizzly Gambling! Notwithstanding your betting budget, you can fund your gambling sessions on Peek-a-Boo slot machine via a $0.40 to $100 per spin betting range. Payouts are quoted as multiples of your stake, so the more you wager, the more you win. The game logo is the highest paying symbol in the game, generating up to 2,500x the stake. Bet the $100 maximum and you'd bank $250,000...a huge sum in Canadian dollars that dives to just $1k on the minimum wager! Thereafter the be-goggled ghost hunter pays out the next best prize of 1,250x for five-of-a-kind! Furthermore, there are a multiple bonus features to sweeten the pot. Keep reading the review or fire up the free play demo on your PC or mobile phone for a practical demonstration of how to win playing Peek-a-Boo slot machine! Microgaming is renowned for its special features and there are plenty in-play in the creative dual payline game. The game logo is a wild symbol substitute that can appear stacked on the reels to complete line wins. Hit the ghost hunter on reel 3 and he'll automatically zap ghosts which are then transported to the Ghost Meter. Fill the meter and up to 13 free spins are activated on a new set of reels featuring 1024 win ways and wilds are super stacked on reels 4 and 5. In addition, there are extra rewards in the form of reel respins for lining up three and four symbol wins! Ghost themed video slots have taken cyberspace by storm. IGT, for one, has given us Ghostbusters slot featuring the characters from the Hollywood blockbuster. Although you'll discover a bonus bonanza comprising randomly triggered mystery features, wild reels, multipliers and more, you can literally bank two times the amount in crisp hard cash playing Microgaming's dynamic Peek-a-Boo slot machine. Go on! Give the reels on Peek-a-Boo slot machine a twirl right away!